There are many top Flashlight Widget Apps for Android out there, so in this post, I will be reviewing 5 of the best Flashlight Widget Apps you should consider when looking for a great Flashlight Widget App. Flashlight applications are a dying breed. The presence of a reliable flashlight app in Android 5.0 Lollipop means that some flashlight apps have to close their board up and sell off the remaining stock. However, just because it’s made by Google doesn’t make it the best flashlight app for Android. Moreover, there are some great alternatives. Luckily, if you get caught up in a situation where you’re in dire need of extra light, there is a range of free quality flashlight apps that you can choose from. Below are some of the best flashlight apps for Android. Color Flashlight is among the most popularly used Flashlight Widget Apps on Android. Are you stuck outside your home without street light? Color Flashlight app also comes handy in the darkest of occasions. You can utilize Color Flashlight app for finding the perfect seat in a dark or poorly lit theater, or for finding your way around when the power goes out at home. It uses either your phone screen or the LED flash on the back of your phone. The app features various patterns, sizes, and colors. Maybe you’re at a club or festival and want your friends to find you, just type a message into Color flashlight, set it to a dazzling color, and lift your hand in the air. It is entirely devoid of in-app purchases, but there are ads. This tool provides light for you whenever and wherever you need it. 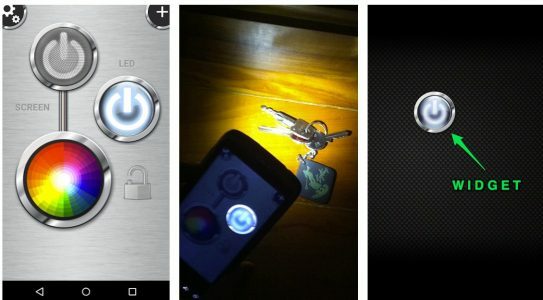 Flashlight HD LED is another older flashlight app with amazing features and capabilities. It’s a simple and straightforward app that can also use your phone screen and LED light on the back of your phone, giving you the brightest and most powerful light feasible. It also features various colors, home screen widgets, and simple design. Once you launch it, the program starts immediately and provides instant light when you hit the “light” button. Flashlight HD LED has a simple and elegantly designed interface. While it has no in-app purchase, it contains ads. Super-Bright LED Flashlight turns your phone into a strong flashlight in the fastest way possible with just a tap. It is also among the most popular flashlight apps for Android, giving you full control to take the full advantage of the LED light in your phone camera. It has a lot of features like a strobe light (on screen only), several presets of military, emergency and SOS, home screen widgets, LED incoming call alert, powerful graphics, etc. Though the Super-Bright LED Flashlight app is completely free, it has ads. This is another popular flashlight app and one of the oldest apps on Google PlayStore. It’s a lightweight app that takes only around 1MB of your data and phone storage. It features strobe light, emergency light, blinking light and Morse code options. It also contains a persistent notification toggle and supports phone screen flashlight and LED light on the back of your phone. There are ads on the tool. This is also one of the unique flashlight apps with no user interface. The app icon only turns your LED light on or off; it doesn’t change shape or color. It supports LED light on the back of your phone only. It features no ads, no in-app purchases, and it’s free. If you need instant light in a pinch, with any of the Android widget apps highlighted above, you can achieve this conveniently. They are all free and don’t have any in-app purchases. The post 5 Best Flashlight Widget Apps for Android appeared first on PHONECORRIDOR.